Support your health in the kitchen with this colorful, delicious and nutritious red curry dish. 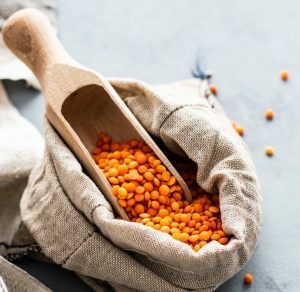 Lentils provide an abundance of protein, are fiber rich and are a great source of complex carbohydrates. Zucchini adds great taste and texture to this dish along with a wealth of vitamins and nutrients. Zucchini brings folate, vitamin A and the antioxidant vitamin c to the table which may help to protect cells from harmful chemicals. Zucchini is also protein rich and has a high fiber content which helps remove toxins from cells in the colon. Garlic and ginger are great cancer-fighting and heart healthy superfoods. Both are known to have anti-inflammatory and anti-cancer properties. Give your health a boost right in your kitchen! Pair this vegan, dairy-free, gluten-free, red curry dish with your favorite protein or enjoy on its own. Cook onion in oil in a 3 1/2- to 4-quart heavy pot over moderate heat, stirring occasionally, until edges are golden (about 6 minutes). Add ginger and garlic and cook, stirring for 1 minute. Add cumin, coriander, turmeric, salt, and chile and cook, stirring for 1 minute. Stir in water, lentils, and coconut milk. Then simmer, covered, stirring occasionally for 5 minutes. Stir in zucchini and simmer, covered, until lentils and zucchini are tender, about 15 minutes. Season with salt and serve with cilantro sprigs scattered on top.